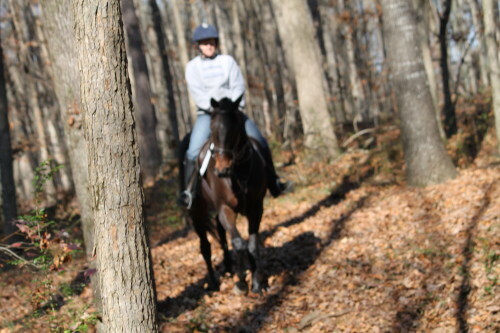 The trail ride was the true test of whether I successfully ride my new OTTB. This seemed like a fitting time to do an update story for you on Maverick. I really am both excited and sad to be moving Maverick next weekend. I honestly can not believe how lucky I have been to not only get Maverick, but to have been taught by you and to have met so many great horse people at your farm. I have proudly owned Maverick now for 5 weeks and aside from marrying my husband and having my children, it has been without a doubt the best 5 weeks of my life. Maverick is the sweetest horse I could ever imagine and he is incredibly smart. Some people think of OTTBs as wild, crazy horses that might run away with you at any given moment. While I think that might be true of some OTTBs, I can tell you that it is not true of Maverick or any of the other horses I have had the pleasure to watch at Bits & Bytes. This weekend Maverick and I will take the next step in our journey together. We will be moving him to his new home closer to me. I am excited to think that I will be able to see him every day, but I am also sad to see him leave his wonderful, temporary home at Bits & Bytes. In addition to it being a great facility, it has been a place of real learning and confidence building for me. I have learned from an expert (Elizabeth) how to do everything from selecting tack that works best for Maverick, to ground work, to riding in the ring, to our first trail ride together last weekend. The trail ride for me was the true test. While I had certainly learned that I could successfully ride Maverick in the ring, being out the trail was something else. I was determined to control my nerves and to have faith that Maverick would be perfect. And He Was! Brat Maverick was great on the trails! We crossed the stream, which a few weeks earlier had caused him to jump over it or run quickly through it. Saturday, he leisurely walked through the water with not a care in the world. We went up and down hills, off the beaten track and he never seemed to be bothered by anything. There was construction being done at the far edge of the property, loud machines, banging and clanging, but that didn’t bother Maverick. A couple of times the horse Elizabeth was riding spooked a little bit and while Maverick did look up and take notice, he walked on calmly as if he had been doing this his whole life. What a wonderful, incredible ride. There was another reason this trail ride was so important to me. 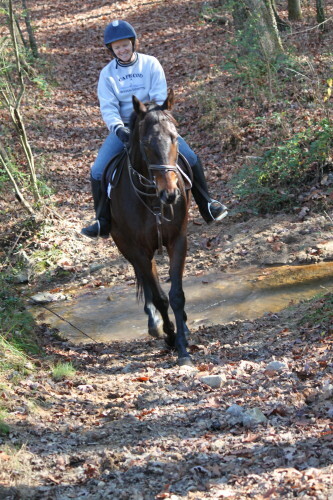 The last trail ride I went on, before I found Elizabeth and Maverick, I fell off the horse I was riding. He was a Spotted Saddle horse who had an unbalanced gait that was challenging. While I was not seriously hurt in the fall, and I did get back on, I must confess that I was a little shook up, very sore for a couple of weeks, and it definitely caused me to doubt my own riding ability. I knew I had to get past that last experience and Maverick was the perfect horse to do it on. He is so balanced and so aware of me as his rider that I was not frightened and felt in control at all times. When Maverick gets concerned, he freezes and perks his ears forward. He trembles a little bit, as if to say, oh my gosh is there a monster out there ready to get me? But when I let him know that everything is ok and that I am not concerned, he just walks on. We even did our first little jump over a log in the woods. It really was probably more of a bunny hop over the log, but he could have jumped it with ease if I felt that I was good enough for that. Our day for jumping at least small logs might come, but for now we will move more leisurely. When I got in my car to drive away from the farm, I called my husband, extremely excited about my first trail ride on Maverick, and told him that if there was ever any doubt in my mind, I now knew for sure that Maverick is my forever horse. I can’t say enough about this wonderful horse I have been lucky enough to be matched with. I also can not say enough about the support and friendship offered by Elizabeth and everyone else at Bits & Bytes. If I lived closer, Bits & Bytes would be Maverick’s home. For now though, we will have a different home and visit Elizabeth and her wonderful horse family as often as we can. Thank you Thank you Thank you. I feel so very blessed!